Disneyland was unsurprisingly crowded for Friday's official Diamond Celebration, but it was totally worth it to get my "I was there" button and join thousands of guests to sing "Feed the Birds" and "Happy Birthday" with Richard Sherman and Ashley Brown. Michael Colglazier, hosted the rededication ceremony in front of Sleeping Beauty Castle. And while the Disneyland president hit all the proper notes as far as thanking guests, cast members and assorted Disney Legends, his delivery left a bit to be desired. Let's just say he's not personality plus delivering an overly-rehearsed, pre-written speech. He needed to inject a lot more excitement and spontaneity into the festivities. Thank goodness for Sherman, Brown and the welcome cast of costumed Disney characters. Bob Iger revealed some of what guests can expect when Shanghai Disney Resort opens in China next year. Mickey's Halloween Party at Disneyland will be held on 17 different nights between September 11th and November 1st this year. Tickets to the late-night event will go on sale for annual passholders, DVC members and Disney Visa cardholders beginning July 22nd. The rest of the world can have at them on July 29th. Marvel's Ant-Man opened at number one at the box office over the weekend, taking in $58 million in the U.S. Neither Anthony nor I have seen it yet. We offer our deepest apologies. What did you think of it? Tilda Swinton has been cast as "The Ancient One" in Marvel's upcoming Doctor Strange. Apparently the white, middle-aged woman will play an elderly, Asian man. Annnnnd......Aladdin is the latest winner in the Disney animation-to-live-action-movie lottery. A prequel is in the works on how the genie ended up in his bottle and got that horrible crick in his neck. 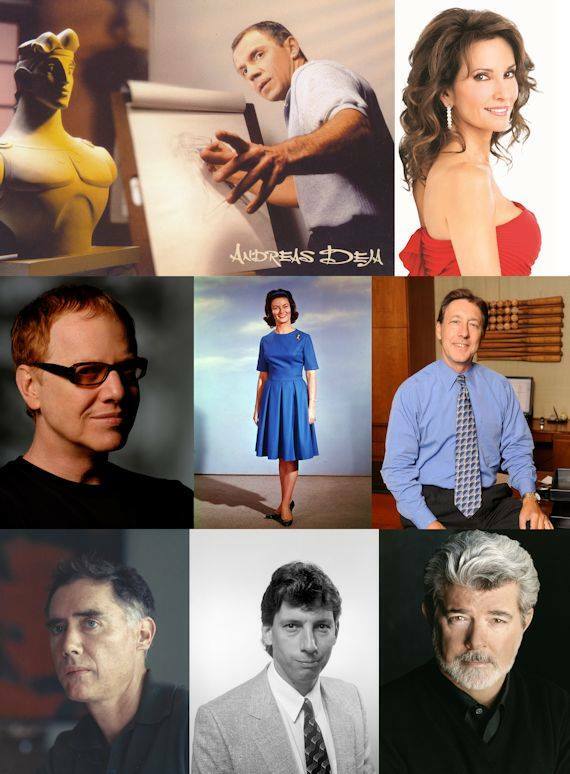 We approve of the newly-named Disney Legends who will be honored at this year's D23 Expo: Andreas Deja, Susan Lucci, Danny Elfman, Julie Reihm Casaletto, George Bodenheimer, Eyvind Earle, Carson Van Osten and George Lucas. They will all be officially inducted on August 14th at the D23 Expo. Disney and Lucasfilm are not amused that GQ appropriated (without permission) a handful of Star Wars characters to join comedian Amy Schumer in a racy photo spread. We're not sure what annoyed them more, Schumer in bed with R2D2 and C3PO or Schumer drinking with the droids and Chewbacca at a biker bar. Regardless, we think all the pics are pretty freakin' funny. BTW, this show marks the one-year anniversary of Inside The Mouse Castle. Hooray!